Hi everyone! I hope you all had a good week. I read an interesting article about why bats turn their heads while they are using echolocation. Everyone who has a dog knows that they turn their head in a really cute way when they are curious about something. Well, bats are just as cute. A scientist named Melville Wohlgemuth noticed that bats moved their heads in a similar way to his dog. He has a cute pug named Willie Nelson. Dr. Wohlgemuth decided to study exactly what these movements in bats were all about. It turns out that bats use head and ear movements in combination with echolocation to find food. 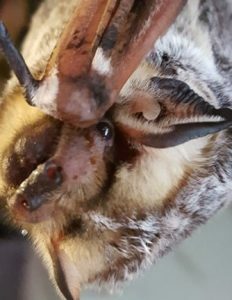 Researchers caught a few big brown bats to study. They developed an experiment where they could track how the bats sent out echolocation sounds to track the location of mealworms. With these experiments, the scientists realized that bat echolocation sounds are coordinated with head and ear movements.